Get the ultimate creative performance on the move with this mighty new range of laptops. 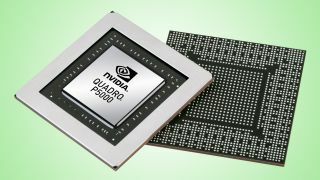 Last year we reported on the launch of NVIDIA's Quadro P6000 GPU, a heavyweight hunk of graphics hardware powered by the company's top-end Pascal architecture. If you need all the performance for VR development or making 3D movies, the Quadro range is the perfect choice for your workstation, but what if you want something a bit more mobile? The good news is that today, NVIDIA has announced the first range of laptops to use Pascal-powered mobile Quadro processors. Boasting three times the graphics performance and twice the compute performance and memory of NVIDIA's previous Maxwell architecture, these hot new mobile workstations are built to tackle everything the most demanding of creative applications can throw at them. There are four new mobile Quadros to choose from, and the most powerful boasts performance close to that of the entry-level P3000 desktop GPU. With the M2200 you get 1024 CUDA cores, 4GB of memory and 2.1 teraflops of performance, meaning that you won't need to compromise too much on power when you're away from your desktop workstation. The new Quadro-powered mobile workstations are coming soon from Dell, HPI, Lenovo, MSI and Fujitsu, and while details are scarce so far, let's face it: they're almost certainly going to be a bit rich for the average designer. But if high-end 3D or VR applications are you're business, you'll be wanting to snap one up as soon as they go on sale.